At September 4th 2012 the public broadcast station NOS announced that Dutch gas prices are higher than ever. For people who don’t own a car, like most of the students, this news is negligible and there is no need to think of a possible solution to deal with this issue. But, unfortunately, everything comes to an end, and there will be a time that we, future car owners, also should start worrying about these developments. So we shall better be prepared to handle with this expensive situation in the future, and that’s a good reason to install the GasBuddy App on your smartphone. 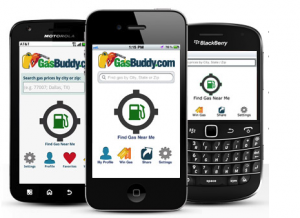 The GasBuddy App is a service of the GasBuddy Organization Inc, which started at the beginning of the century as an initiative to provide the general public with access to local current gas prices. This free app uses crowd recommendations to suggest the best places to fill up. Every week, when users report gas prices to help other people to find cheap gas, they have a chance of winning $250 gas. Also they can earn points and awards for reporting gas prices. By having access to the most recent prices using the GasBuddy App consumers are able to locate the most inexpensive fuel prices in the city. When you downloaded the latest version of GasBuddy, which is available for iPhone, Android, Windows Phone and Blackberry, you see a sign-up page where you can choose your nickname, enter an email address, zip code and a password. 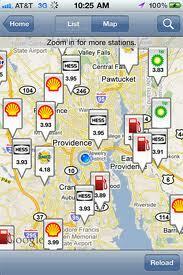 Thereafter GasBuddy simply uses GPS to find the nearby stations, listing them in order of proximity or price. You can also see the stations arrayed on Google maps and you can get the directions. According to Time Magazine, GasBuddy is one of the fifty best Iphone Apps of 2012 and they have plenty of reasons to be optimistic about this service. If you are using this app, there are a lot of advantages. If you are driving trough an area you don’t know that well, GasBuddy is showing you the way ànd the prices for the nearest gas stations. And even if you are driving in your own familiar area, GasBuddy will show you all the gas stations, the little fuel suppliers, the ones you maybe already know, and even the unstaffed gas stations. This is a good way for little fuel suppliers to compete in the big competition of the gas prices. So if you’re almost empty, of course there are also navigation tools who can help you find the gas station. But if you look at your GasBuddy, the application will tell were the most profitable filling station is, if you are on the high road and even in a small village. And not only the most profitable, gas or diesel as well. Also for employees with a lease car there are benefits. Their company mostly gives them a special card that they can use to fill their car up. 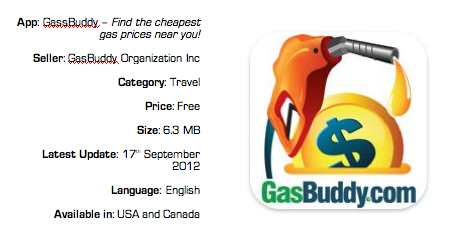 With the help of GasBuddy the driver now easily can find this specific gas station where he can use his card to fill up. The content of the application is provided by the users themselves, and remarkable often refreshed and therefore very up to date. But they won’t take any risks, so they notice also the last time and date of the updated price. Another advantage for the consumers themselves is that they become more aware of the prices what can help in the competitiveness of the prices, which is another big benefit. At last it is easy in use, so perfect for all drivers. FuelMeUp is the only real competitive application of GasBuddy, but they have a less active community of users, therefore the prices aren’t that up to date as the prices noted in GasBuddy. Unfortunately GasBuddy also has a few risks. It can lead to more miles, if you are blindly driving to the cheapest gas station, even if you have to drive a bit more. So stay critical and look for a good combination of distance and price. Because you don’t want a cheap gas price if you are driving a lot more than you actually have to. And stay also focused on the way. We don’t want people to look at their GasBuddy instead of the traffic. The last big disadvantage is that this application isn’t available in Europe yet. This last disadvantage we can turn into a advantage because by the time it will appear in Europe, it will be improved and ready to show us the profitable gas stations in our area. Luckily it is a problem of the future, and till then, let’s just take our bikes.